If it could stomp down a runway it would! RAOW! I’m talking about my kotatsu. 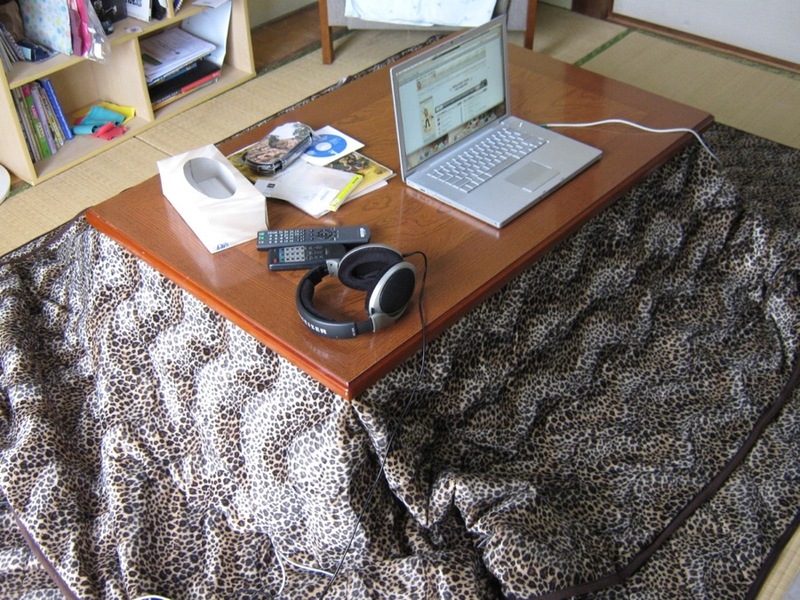 A kotatsu is a table whose top comes off so you can stick a blanket between the top and the bottom, and there’s a heating unit underneath so you can stay nice and toasty while sitting at it. It’s certainly gotten chillier here in Fukuoka. While I don’t percieve it to be as cold as nearly everyone else, I did swallow my pride as a Michigander and plugged in my kotatsu yesterday. But, for now the weakest setting is plenty. Anyway, while the kotatsu was one of the pieces of furniture I just bought from my predecessor, I had to buy a blanket for it (also called 布団 “futon”). I don’t have a car, and I don’t like to bother people, so I just went to the home store down the street from the juutaku. The selection wasn’t great, and only the blankets for small, square kotatsu were pretty. But, I have a big rectangular (長方形) one, so my choice of blankets was limited to plain, ugly, or gaudy. I went with gaudy. So, there is now a leopard in my living room. Luckily, the furniture is all pretty simple, so it doesn’t look too bad. And I can call it “fierce,” LOL. 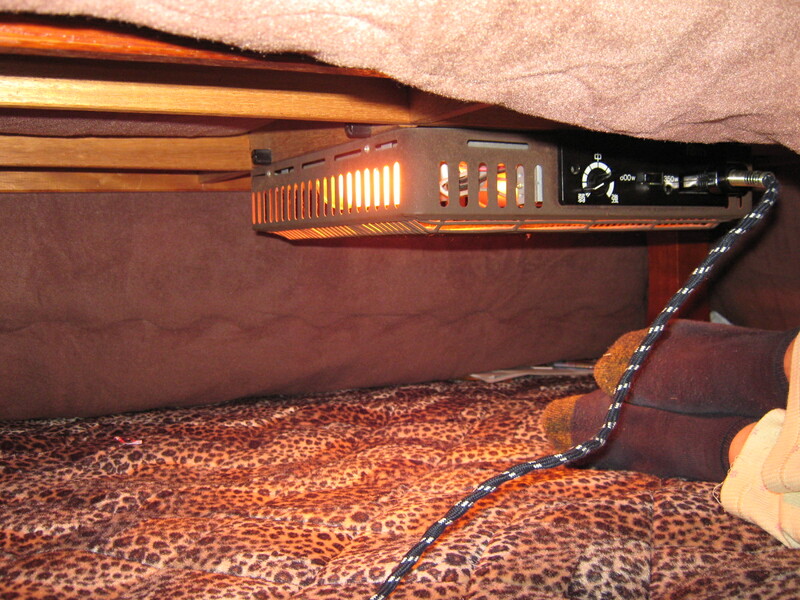 Below are photos of the kotatsu’s transformation from mere table to ferocious heat-retaining beast. ^o^ Well, I should’ve taken a picture of it before I put the rug down, but oh well. Step 1: Cut a hole in a box. No, wait, that's not right. 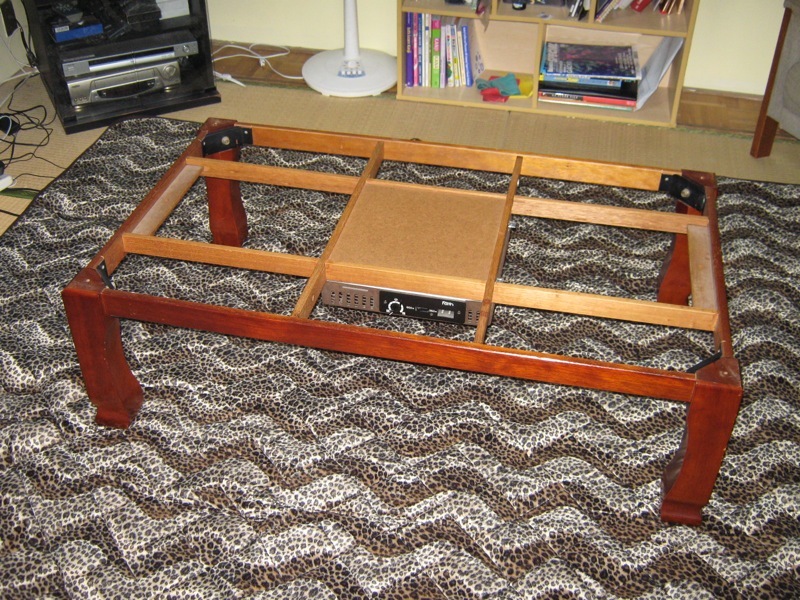 Step 1: Put the rug under the kotatsu. Step 2: Take the top off. You can see the heating unit in the center. Step 3: But the blanket on and put the top back. 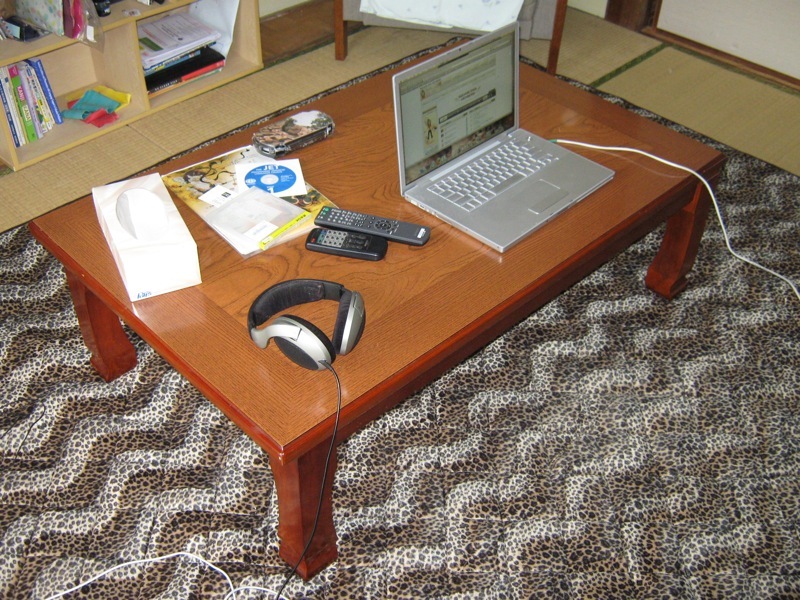 While this kotatsu is big, it's very light, so I can do all this by myself. Step 4: Turn it on and get TOASTY! The lighting is different in each photo because I didn’t take them all on the same day. I put the rug down about a month ago, I put the blanket on about a week ago, and I first used the heater yesterday. I don’t know if the blanket will prevent the heat from reaching the tabletop if I turn it up to a higher setting, but for now the top remains cold so I can continue using my computer on the kotatsu without worrying about it getting too hot. Actually, I can only take about 30 minutes of having the heat on, after that I turn it off and let it cool down. I think it’s easy for anyone to get used to cold as long as they keep in mind that the perception of temperature is relative. If nothing else, you can get yourself warmer by going someplace colder without putting on more layers, and when you go back to where you were you’ll feel warm. At school, the teachers’ room is pretty cold, but since the windows are open in the hallways, if I go outside of the teachers’ room for a while, when I go back it’ll feel warm. Likewise, at home I converted my kotatsu and bedsheets slowly because if I’d gone all the way to winter gear from the first chill, I’d feel even colder now. Perhaps doing this seems a bit masochistic, but without central heating (not common in Japan, except maybe on Hokkaido), and since I don’t want to deal with a kerosene heater (supposedly the new ones aren’t so stinky, but you still have to open the windows for ventilation every now and then, which defeats the purpose) it’s the easiest thing to do, and for me, it’s not uncomfortable. If nothing else, there’s the warm setting of my air conditioner, and I can go buy an electric space heater should that become necessary.